The 2019 Lexus UX is a brand-new sub-compact crossover that slots below the compact NX in Lexus’s crossover lineup. With a starting price of $32,000, the UX competes with the likes of the Mercedes-Benz GLA , Cadillac XT4, and BMW X2. 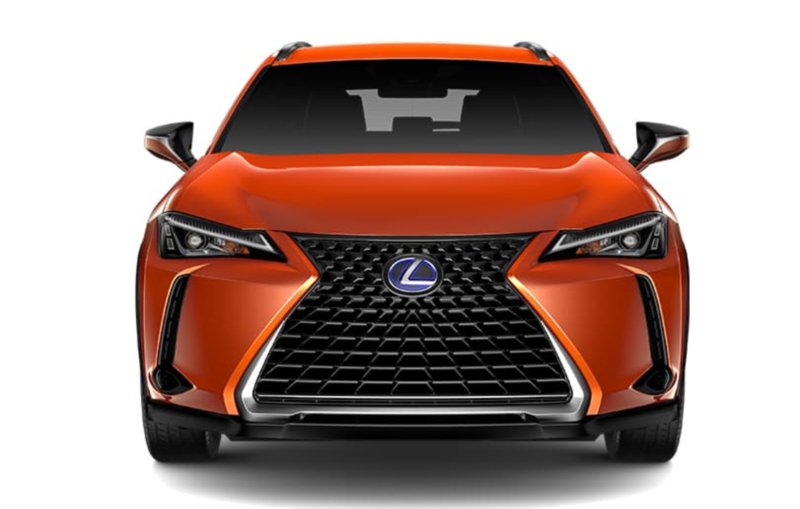 The brand’s signature grill dominates the front of the UX while aggressive sculpting adds character to the bodysides, echoing the larger Lexus crossovers. Out back, a horizontal light fixture connects both taillamps and gives the UX a unique and premium appearance. Overall, Lexus’s bold and somewhat controversial styling is perhaps best suited to the proportions of the UX; it’s a handsome vehicle. Inside, the interior features a harmonious design that has more cohesion than the larger NX. Unlike its competitors, Lexus only offers imitation leather seating surfaces, called NuLuxe, in the UX, which could deter some shoppers. According to Lexus the dashboard design which “flows seamlessly into the hood” was inspired by engawa, a Japanese architectural concept of bringing together the inside with the outside. More Japanese influence can be found with the available washi interior trim which was designed to mimic the grain of Japanese paper. Following Infiniti‘s lead, it’s nice to see Lexus embracing the rich Asian design influences with recent releases, rather than following the traditionally European design idioms. It seems that Lexus is finally coming into its own in terms of design, and its about time. The UX is available in front- and all-wheel-drive and is powered by a 2.0-liter 4-cylinder engine. An available hybrid that comes standard with all-wheel-drive delivers excellent fuel efficiency, however does not offer much of a performance boost. Pros: The UX is competitively priced and offers a quiet and comfortable driving experience that eludes most mainstream sub-compact crossovers. It sleek exterior styling is modern and premium, while its interior is thoughtfully crafted and nicely detailed. Cons: With engines designed more for efficiency than all-out performance, the UX is adequate but slower than some competitors. A lack of available leather trim is a letdown when brands like Honda and Kia offer it on their sub-compact crossovers. As with most vehicles within this class, the UX may be too snug of a fit for some, so taking it for a test drive is essential to ensure a comfortable driving position can be attained. Looks Best In: Lexus typically offers a conservative color palate for its crossovers, its refreshing then to see some daring shades incorporated into the UX’s repertoire. Bold colors like Ultra Sonic Blue Mica 2.0 and Cadmium Orange are flashy and fun. Nori Green Pearl, a unique medium-dark green, is perhaps the best color on offer. By virtue of green not being a particularly popular exterior color currently, a UX finished in this captivating color will stand out from the crowd and it better matches the UX’s more leisurely demeanor than more racing color choices. The interior finished Birch, an attractive gray, looks pleasant and airy. However, Glazed Caramel looks rich and decadent and fits the UX’s interior best. Competition: The sub-compact luxury crossover category is rapidly expanding with new models. The Mercedes-Benz GLA, BMW X1 and Audi Q3 are priced at or near the UX, however some features that are standard on the UX are available only as options on those models. Volvo offers the XC40, which has an attractive upright design and roomy interior, although fuel mileage doesn’t come close to matching even the non-hybrid UX. Speaking of hybrids, the UX is currently the only vehicle in its class to offer one, and that could be a deciding factor to many shoppers. Safety Score: As of publication date the 2019 Lexus UX has not yet been tested by the Insurance Institute for Highway Safety. However, the Toyota C-HR, with which the Lexus UX shares its platform, received strong ratings from the agency. Summary: The UX is a well-rounded luxury sub-compact crossover. A quiet and compliant ride combined with sophisticated design and a competitive starting price make the Lexus UX a compelling choice within its segment, especially the hybrid model that sets it apart from all competitors. Taller shoppers and those planning on regularly using the back seat may be better served by moving one size up to the Lexus NX.